My love for bone broth is deep. It’s nutritious and comforting. Bones themselves, are rich in vitamins and nutrients such as calcium, magnesium, and phosphorous. Tissues and bones also contain collagen. Collagen has a wide array of awesome benefits to the body in itself, we all know it’s anti-aging properties, right?? Cooking it down forms a gelatin, which contains amino acids which are the building blocks of protein. That’s cool, but what can bone broth do for you? Many things. Bone broth is said to help support a healthy immune system, aids in sleep, improves skin, assists in healing your gut, assist in healing the common cold, may help reduce inflammation and help with osteoporosis. It’s high in protein therefore helps the body feel fuller longer and may aid in weight loss. 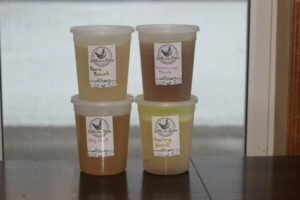 The list goes on and on and as a bone broth drinker I just love the comfort it gives to me. It’s the first thing I turn too when I’m feeling a cold creep in. Sounds like we should all be trading in the Gingerale for a mug of bone broth when we are sick, right? Long before Gingerale and Gatorade this is what was used, my guess is it was also much more effective! I recently began sipping a mug of it everyday and 2019 has already got me thinking a lot about the powers of healing from within which is why I’ve decided to start making a few flavours to sell at our farm store. Sometimes, we just don’t have the time to do it ourselves, or perhaps you just want to pick some up for a friend or family member who could use it, now you know where to find some! We are currently offering 4 flavours using our pastured, antibiotic free, non-gmo, free range chicken bones. Healing Blend– This blend is made with our bones (we have this blend using only bones OR bones and feet for extra gelatin a.k.a. collagen)organic turmeric, ginger, black peppercorn, onion and garlic. A very small amount of salt and pepper goes into the small batch with a couple tablespoons of apple cider vinegar to help release mineral from the bones. I choose to add salt and pepper as well as cayenne pepper to my mug after I heat it up but I wanted this blend to be very low sodium to assist in healing. Bare Boned- Just like it sounds! double the amount of bones/ small batch, pinch of S & P, apple cider vinegar. Lemon, Veg & Herb- A more flavourful blend simmered with organic carrots & celery, ginger, garlic, pepper, onion, organic basil, thyme, lemon, salt and pepper, apple cider vinegar. Veg Out– No bones about this one. This is our vegetable broth, simmered in organic thyme, dill, bay leaves, carrots, onions, garlic, sweet potato, ginger, celery, salt & pepper & apple cider vinegar. Liquid gold! Sip it on it’s own, cook quinoa or rice with it, add to soups, stews, ext.. Add your own seasoning such as S & P as desired. Remember, my goal was to offer low sodium options so if you need that extra seasoning go ahead and add it! 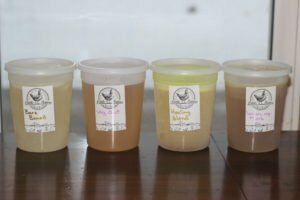 All bone broth is packaged in 32 ounce BPA free Freezable containers and cost $10/container. This has been a labour of love and I’ll be introducing a few new flavours next month. I love the idea of healing from within and I’m so happy to start the new year off with all of you this way. Available at our farm store this Saturday from 9am-1pm. As always just contact us if you need an alternate pick up time. Cheers to a new year, health, healing & happiness!